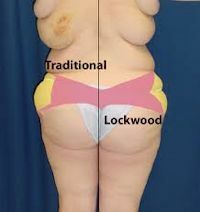 This patient had a body lift to improve her overall body profile. Although she had not had any dramatic weight reduction, the skin was sagging around her stomach, hip, and the buttock area. She wanted a tightened body profile. In addition to the excised skin, she also had 1650 cc of fat removed. The body lift includes a tummy tuck, thigh lift, abdominoplasty (tummy tuck), and a buttocks lift. Dr. Ricardo Rodriguez, a Board Certified Plastic Surgeon has over 20 years experience performing the Body Lift Procedure. The procedure is performed under IV anesthesia in Dr. Rodriguez's AAAASF accredited Surgery Center in Baltimore, Maryland.